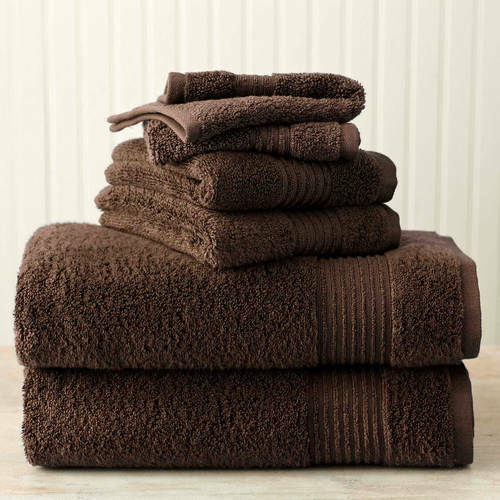 I purchased 4 sets of this towel in the chocolate brown color 6 months ago. First off the the color was the perfect shade of chocolate brown I was looking for and the towels had (and still have) a soft plush feel to them. The color has not faded either but that is where the good points end.The towels did have a high lint content which took about 3 months of heavy use & washing to stop shedding. Although plush the absorbancy is horrible, they do not completely dry your skin. The worst part is every time we used these towels they would leave your skin damp with a trail of dark brown fibers stuck all over your skin. Also the fibers immediately started pulling after the first use, I find a new pull in the fibers every time the towels are washed. After 6 months they are starting to look ratty. This is the 2nd brand of Better homes and Garden made towels that I have had problems with. Purchased the Thick and Plush line which was more expensive but they were found to be equally as bad. Home territory searches the web to find the best prices and availability on Bath Towels and related products foir your home like Better Homes and Gardens Extra Absorbent Bath Towel, 4 Piece Assorted Set. For this page, related items include products we find that match the following keywords: "Bath Towel|Towel Set" at our vendor partner Walmart - Click More Info / Buy Now to check for price rollbacks!. Better Homes and Gardens Extra Absorbent Bath Towel, 4 Piece Assorted Set is one of 180 Bath Towels and related products available for sale through HomeTerritory.com, If you have any questions on this product, please give us a call at 734-971-1210 during the hours of 9am - 5pm EST for assistance. Thank you for shopping at Home Territory, the home furnishings superstore!